Comcast’s acquisition of Watchwith may not have garnered the same attention as the purchase of NBCU. However, it brings something that is an essential foundation of future advanced video services: a data track capturing exactly where in a video all the important events occur. Watchwith, a platform for the creation of enhanced time-based metadata. Both tools will continue to be available to programmers now that Watchwith is part of Comcast. In the past, Watchwith has leveraged temporal metadata to create enhanced activated experiences. Though the approach had some big successes, it also had some limitations. 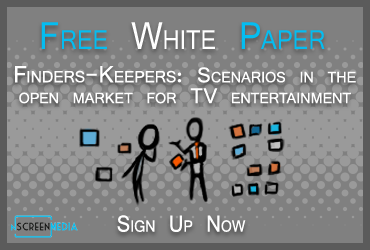 Watchwith made its name as a key enabler of advanced second screen experiences with content providers such as USA network. The Watchwith platform allowed fans of a show like Psych to get bonus content on a phone or tablet through USA’s app. Character quotes, polls, quizzes, and fun facts appeared in the app synchronized with the show being watched on television. One of the problems with this approach to activating the experience was that a viewer had to have a specific app running on their phone while watching the show to reap the benefits. That limited the appeal of the features to the most rabid of fans. It also artificially separated the data experience from the video experience. These two problems made the approach a lot less interesting to programmers. Comcast can now solve these limitations. It can deliver the activated experiences to millions of X1 users by adding the necessary functionality to the X1 client. Subscribers can then enjoy the bonus content directly on their TVs using only the X1 remote. And with millions of potential viewers, programmers (and advertisers) have much more reason to create and innovate the bonus features. But the temporal metadata does a lot more than just allow the creation of new video entertainment experiences. It is an essential foundation for more sophisticated search and discovery functionality and experiences. Simply put, a search and discovery (SandD) solution is only as good as the data upon which it operates. Without robust temporal metadata, there is a limit to how much an SandD solution can do. Rich time-based metadata not only helps people get to the content they want faster, but also helps them access it in new ways. For example, users can search for a key quote or scene in a movie. Then they can go directly to it, rather than having to fast-forward to find it themselves. Search and discovery, particularly using voice commands, is emerging as a key battleground in 2017. Dish has announced it will leverage Amazon’s Alexa to control its Hopper DVR this year. And platforms like Roku and Xbox are providing voice search solutions. Watchwith time-based rich metadata should help make Comcast’s X1 voice search and discovery competitive with the best of them. Rich time-based metadata about TV shows and movies will become increasingly essential to video providers in 2017. It enables the creation of enhanced experiences far beyond the capabilities of traditional television. It is the foundation of enhanced search and discovery features, particularly those driven by a user’s voice. This will be a key battleground between providers in 2017.